Spurred by evolving technology, organization, and tactics, smoothbore artillery achieved its maturity during the eighteenth century. Constantly improving metallurgy allowed for lighter and shorter gun tubes that did not sacrifice safety or accuracy. In addition, new gun carriages greatly aided the mobility of field artillery. The growing use of at least nominally interchangeable components also presented a valuable advantage in facilitating repairs, especially in the field. 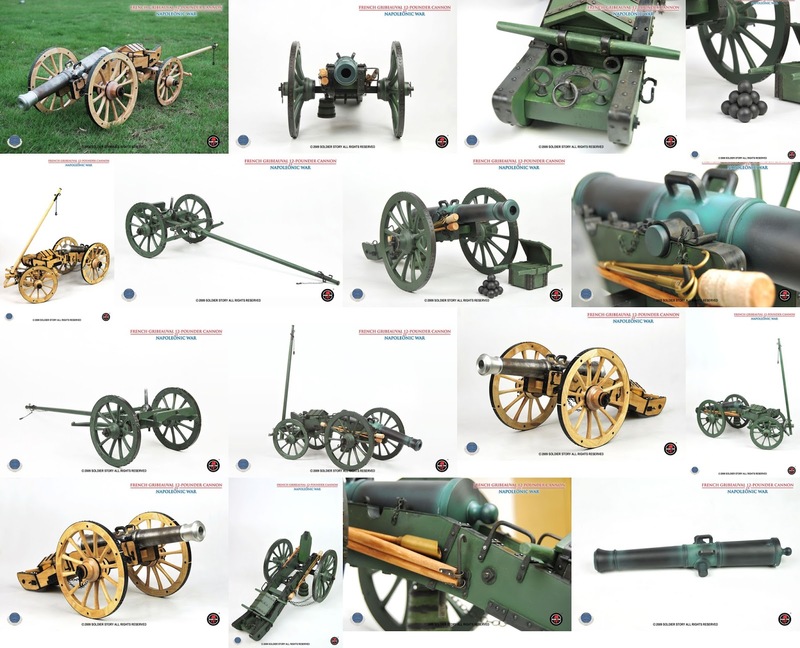 Except for slight national differences, typically in decoration, artillery designers went on to partially reach their elusive goal of standardization of basic gun types. The period of the late seventeenth and early eighteenth centuries at last saw the end of cannons being designated by such confusing and fanciful names as saker, minion, and basilisk. Instead, artillery, still cast in both bronze and iron, was classified more precisely according to a basic type, as to its use, bore diameter, or the weight of its projectile. Artillery's growing complexity and sophistication attracted the attention of some of the most talented scientists, mathematicians, and engineers of the period. The English engineer and mathematician Benjamin Robins (1707-1751) published New Principles of Gunnery in 1742 and conducted experiments concerning the calculation of muzzle velocities. He published the findings of these tests-conducted with contemporary flintlock muskets-in London in 1747, and translations in German and French soon followed. In 1775, Robins’s fellow countryman and mathematics professor at the Royal Military Academy, Charles Hutton (1737-1823), continued his explorations. In that year Hutton applied Robins's methods to experiments with a 6-pounder cannon at Woolwich. On the Continent, Bernard Forest de Belidor (1698-1761), a Spanish-born mathematician, engineer, and professor of artillery at the French military academy at La Fere, applied his talents to ballistics. His studies led to more efficient powder measurements to make possible the use of less powder while achieving the same results as earlier cartridges. A number of influential artillerists emerged during the century to play major roles in pushing smoothbore artillery to the limits of its capabilities. Chief among these were Joseph Wenzel, Prince Lichtenstein of Austria, General John Armstrong of Britain, and General Jean Valliere of France. It was, however, Valliere's fellow countryman Jean Baptiste Gribeauval who initiated considerable changes to all aspects of artillery design, organization, and tactics. By the end of the century the combination of perfected designs, organization, and tactics had elevated artillery to a role equal to that of the already established and celebrated infantry and cavalry. The Napoleonic wars further helped to establish artillery as an independent arm. Earlier theory, based on the regimental guns pioneered by Gustavus Adolphus, relied on relatively small numbers of light guns parceled out piecemeal to infantry units. The Napoleonic campaigns, however, proved the effectiveness of heavier massed artillery fire at decisive moments. To that end, England and France led in establishing a central artillery command capable of providing critical firepower when needed. As ordnance and artillery theory matured, so did the appreciation that professional artillerists required specialized training, as did members of the other technical or “scientific” arm, the engineers. To that end, France and Austria led the other European powers in establishing the first artillery schools and in fully integrating their artillery arms into their overall military structures. French artillery held an advantage early in the period owing to a series of reforms under Louis XIV and the work of General Jean Valliere in the 1730s. England's artillery initially lagged somewhat behind that of the major Continental powers, as early in the century it was not fully integrated into the army structure and remained under the overall authority of the master general of ordnance. Britain did, however, achieve a major advantage in the field, as it was the only power during the period to adopt the solid block trail carriage. It eventually became evident that the training and education of artillerists must keep pace with the growing sophistication of their weapons. Having tentatively approached the issue with an informal training program at Douai in 1679, France took the lead in artillery schooling in 1720. In that year it established Europe's first national artillery school that, in effect, also broke ground as the world's fir s t modern professional school. The French artillery school attracted some of the most brilliant teachers of the day and stressed a rigorous program incorporating mathematics, the sciences, and practical fie l d exercises. Other nations soon followed the French example, providing a level of professionalism among artillerists matched only by their fellow “scientific” arm, the engineers. As the century progressed, both Valliere and Gribeauval continued to stress the need for educated artillery officers and men. Valliere emphasized mathematics, technical drawing, and theory, while Gribeauval added programs requiring hands-on skills and set up schools for noncommissioned officers. 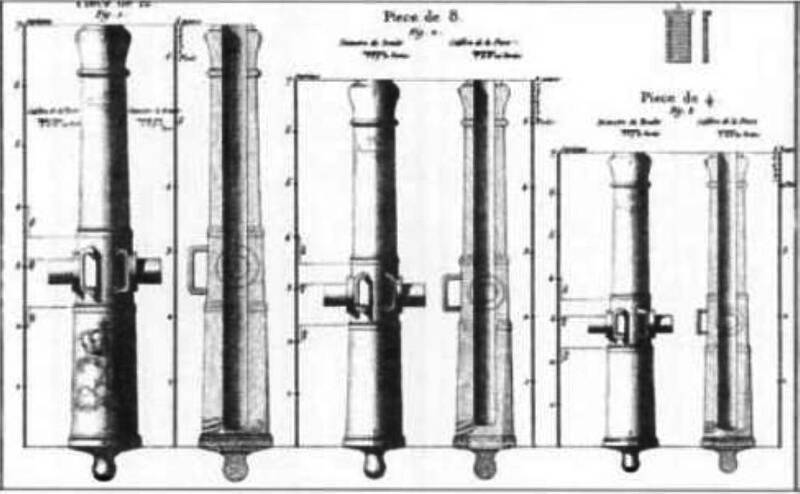 Part of the Gribeauval system: cannons of 12, 8 and 4. French artillery at last reached prominence under the direction of Jean Baptiste Vaquette de Gribeauval (1715-1789). Having entered the French army as a volunteer, Gribeauval rose in the ranks and gained a reputation as a skilled artillerist. He was impressed early in his career by Prussian artillery while on an inspection trip to that country before the Seven Years' War. During the Seven Years' War, Gribeauval served on detached duty with the Austrian army as a general of artillery, for which service he received the rank of lieutenant general and the Cross of Maria Theresa. His talents were so apparent during his service with the Austrians that none other than Frederick the Great, who had personally witnessed Gribeauval's handiwork against his own forces during the 1761 siege of Schweidnitz, offered him a commission in the Prussian army. Gribeuaval, however, remained loyal to France and was rewarded upon his return home in 1762 with the French rank of lieutenant general and the Order of Saint Louis. Upon his return to active French service, he focused on rectifying the deficiencies of the Valliere System and pushed for more artillery reforms. Gribeauval also respected Lichtenstein's work immensely but wanted to carry his ideas to the logical conclusion of a totally integrated artillery system. Upon his elevation to inspector-general of the artillery by Louis XIV in 1776, Gribeauval at last undertook a complete overhaul of the French artillery system. Touching nearly every aspect of cannon design, construction, carriages, and deployment, the so-called Gribeauval System served France into the Napoleonic Era. It was so far-reaching that it also profoundly influenced artillery in other nations, including that of the emerging United States. The general also designated French cannons by their specific use, including field, siege, garrison, and seacoast, with each type mounted on the appropriately specialized carriage. These reforms in combination with Gribeauval's strong advocacy of close artillery support for infantry made France's the most advanced artillery during the late eighteenth and early nineteenth centuries. 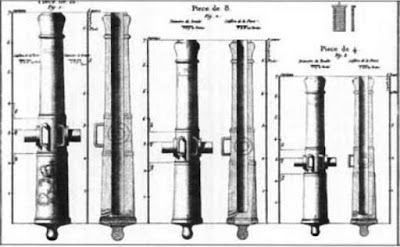 Gribeauval began his task by redesigning the French gun tubes to produce lighter, more efficient barrels. Following the method already adopted by a number of other powers, he at last ordered that the bores of French gun tubes be drilled rather than cast around a mandrel. This procedure produced more exact tolerances within the bore and reduced the windage between the projectile and the bore's wall. That, in turn, reduced the loss of energy from the blow-by of the cannon's detonation around the ball. As this improvement made the weapon more efficient, less powder was needed, and thus the barrel's walls could be thinned to create a lighter piece, a goal that Gribeauval continued to seek by shortening the barrel tubes. Gribeauval's gun tubes were, however, still somewhat heavier than their Prussian and Austrian counterparts; he nevertheless considered the extra weight acceptable, as it helped lengthen the service life of the pieces. The ratio of the weight of gun metal to that of an individual shot in the Gribeauval System was 150 pounds of gun metal to 1 pound of shot, whereas that of the Austrians was 120 to 1 and the Prussians, 100 to 1. Gribeauval also did away with Valliere's ornate baroque embellishments in favor of a plainer, more businesslike appearance to his gun tubes. In the process the dolphins lost their ornamental sculpturing and instead became simple, functional handles. He also raised the trunnions to a point slightly below the barrel's centerline and increased their diameter where they met the barrel with reinforcements known as rimbases. Gribeauval's extensive field service also influenced his introduction of one of the most practical field artillery accessories-the prolong. In effect nothing more than a thick, long rope, the prolong allowed artillerists to connect the piece to the limber without directly mounting the carriage to the limber. This gave the crews two significant advantages in combat-it still provided the pulling power of the horse team, yet allowed the piece to be more easily and quickly manipulated by the gun crew. In addition, it also allowed the horses and limber to be at a somewhat safer distance when under fire. To reduce the tendency of the rear of the carriage to dig into the ground when being dragged by prolong, Gribeauval also redesigned the lower end of the trail with a slight upward tilt. His intimate understanding of the practical problems of field artillerists operating on rough, broken, or muddy ground was also evident in Gribeauval's introduction of the bricole. A leather cross-belt, the bricole allowed gun crews to harness themselves to metal rings on the gun carriage to help manhandle it over rough terrain. Gribeauval's other innovations included improved ammunition gauges to reduce windage and a better bore searcher. He also developed the hausse rear sight, a removable, highly accurate instrument that later saw adoption by numerous other powers. Having worked with artillery and artillerists, Gribeauval also dictated that rather than drawing weapons from a general stockpile, individual artillery companies should be permanently assigned specific pieces. This innovation ensured that, as they were more invested in their cannons, crews would more properly maintain their pieces rather than perform any but the most perfunctory cleaning and repairs. Moreover, as all artillery pieces-regardless of the sophistication of manufacture-have unique quirks, crews would be more likely to understand and thus more efficiently serve their weapons.